From an early age, Anna has been passionate about performance and visual arts, both of which she pursued in her hometown of San Francisco. Eventually focusing her attention on interior design, Anna moved to NYC to study at the School of Visual Arts where she received a BFA in interior design. She believes that great design is a balance of creativity and perseverance. Anna enjoys the journey from inspiration to reality — defining the character and impact of space. Interior design is not just a career to her, it has shaped who she is. When Anna is not designing, she can be found in the boxing ring perfecting her one-two punch, on her mat practicing yoga, or in her kitchen crafting culinary delights. Spacesmith joins the 2019 Beverly Willis Awards Gala! Women of American Architecture. Pictured here from left: Anna Harea, Jaclyn Lieck, Elisabeth Post-Marner, Olga Anaya and Julia Libby. Ámbar Margarida is a Principal who has been with Spacesmith since 2009. She has worked with leading global brands on a diverse cross section of architectural interiors projects including Avon, Bacardi, MTV Networks, BlackRock, US State Department Overseas Building Operations and New York State. As an accredited green building professional, Ámbar is an expert in designing healthy spaces. These are spaces that contribute to employee wellbeing and satisfaction and have healthy indoor air quality, access to quality views and daylight, plantings and proper ergonomics. Ámbar teaches in the Interior Design Bachelors program at the School of Visual Arts in NYC and is a founding member of the Latino American Commercial Real Estate Association (LACREA). Why are people afraid of color? Born and raised in Houston, Texas, Amy found her way to New York after graduate school to begin her career in architecture. Her background in fabrication and working with world renowned artists gives her a unique point of view when working on the wide range of projects at Spacesmith. Originally from Caracas, Venezuela, Andreina has always had a strong interest in art, architecture, and design, which is why she relocated to New York City to pursue a BFA in interior design from the School of Visual Arts. She is particularly passionate about graphic design as it allows her to boldly present her ideas. When not at work, Andreina enjoys capturing the City's cultural diversity through photography. 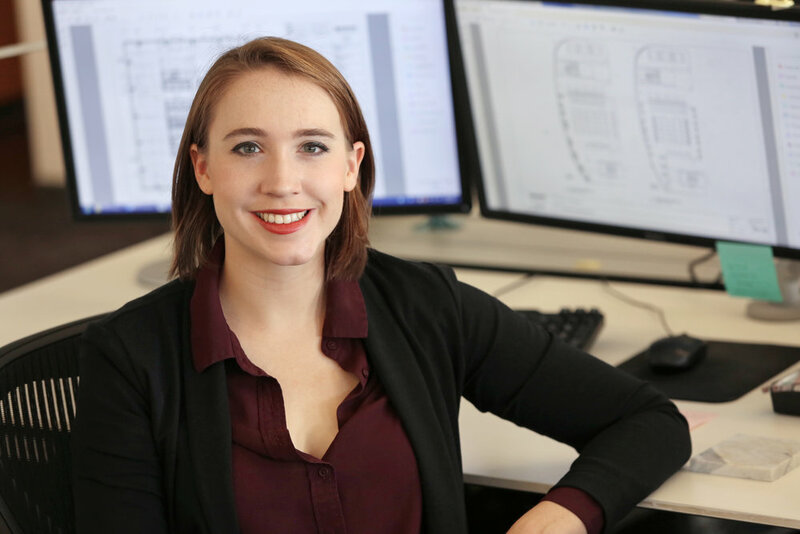 Alexandra’s strong graphic eye, attention to detail and extensive software knowledge enable her to translate individual project needs to reality. Her bright, enthusiastic and dependable disposition makes her a valuable asset to the our team. Since joining Spacesmith in 2011, her role has evolved into a Designer and Project Manager. In this capacity, she has been instrumental in project delivery for US Embassy complexes in Mexico City, Ankara, and Nassau. In addition, she has contributed to workplace projects for major corporations like Global Brands Group. Alexandra holds a Bachelor of Fine Arts in Interior Design from the School of Visual Arts. Growing up in New Jersey, Danielle learned all of the basic knowledge of building interiors from her father, who is skilled in wood-working and construction. In 2016 she graduated from School of Visual Arts with a BFA in Interior Design and received Best Thesis Award for her project that aimed to help the design-build community in NYC. Danielle believes that all Interior Designers should know how to physically create their own ideas, and that is done solely by having hands-on experience. The Garage is a 78,000 sq. ft. facility that would provide both space and equipment, such as wood, metal, and digital fabrication to NYC residents who desire an affordable space to start and finish any project. Diane's primary responsibility is to assist the partners of the firm in business and personal administrative tasks, including calls, research, database maintenance, and other support functions. For the past 11 years, Diane has kept Spacesmith organized, with a strong ability to interface with both internal and external business associates. Drew always seeks to find an efficient, holistic approach to all his projects, ensuring a positive and successful outcome for all end users. Drew continues his passion for exploration by competing in triathlons and ultra running events all around the country. When not at work, you can find him weaving through the streets of NYC most mornings and evenings on foot, exploring. Elisabeth Post-Marner is a registered architect with over 30 years of experience in the design of corporate interiors. She has spent much of her career looking at alternative workplace strategies to enhance a client’s productivity. Her projects have received awards from the AIA and United States Green Building Council. With a solid background in communications, sales and marketing, Helen brings an in-depth knowledge of digital media and web analytics tools to create an effective and integrated brand presence. Close Proximity...thru the "Rear Window"
Jaclyn is a Texas native who was drawn to the East Coast for its energy, history, and culture. She graduated from the University of Texas at Austin with a Bachelor of Architecture. Since having worked on projects based in New York, Texas, Washington DC, Germany, and Mexico, she is interested in the unique contextual and cultural relationships that exist in the built environment, and strives to study them in every project. Having a longstanding interest in art, she enjoys drawing and painting subjects from her travels in her free time. Julia is a coastal Massachusetts/ Rhode Island area native who relocated to NYC in pursuit of a fast-paced creative environment. She has a wide range of architectural and interior experiences including luxury retail, high-rise residential, commercial headquarters and workplace interiors. Julia has a strong background in the arts; she enjoys painting, figure drawing and creative projects in her spare time. She is currently pursuing her Massachusetts state registration. With a strong background in performing and graphic arts, Kristen most enjoys the creative aspects of marketing. When not advocating for the oxford comma, digging up “Fun Facts”, or pushing proposal paperwork, she can be found practicing her pentatonic scales. A Bronx native, Lisa has always been fascinated by the constant change of the built environment. In 2016, Lisa graduated with a M.Arch from Wentworth Institute of Technology in Boston, MA. Prior to joining Spacesmith, Lisa worked for a nonprofit building schools abroad. She also has experience with high-end residential design. During her free time, Lisa enjoys painting and spending time with family and friends. Marc’s lifelong study of history makes him a perfect fit for a firm dedicated to the creation of enduring architecture. He brings 25 years of experience to his current role, in which he oversees the development of construction documentation and specifications. By using emerging technology to build more efficiently, as well as to further the art of design, Marc helps to produce imaginative and inspiring results for Spacesmith’s clients. Margaret O’Neill oversees the firm’s functioning in terms of Finance and Administration. She oversees office management to achieve maximum expense control and productivity. Margaret draws on over 15 years of experience in which she handles accounts receivable, accounts payable, payroll, job costing, project management, budgeting, and completion of financial reports for presentation to accountant and CEO. Max graduated with high honors from Virginia Commonwealth University with a degree in Interior Design. When it comes to art and design, he believes in using different sets of parameters to explore design possibilities. Max grew up in Russia and speaks two languages. He loves playing soccer, watercolor, and cooking traditional Russian dishes. Michel is known for his dedication to teamwork, his precision, and exceptional endurance. A citizen of both Luxembourg and the United States, Michel is fluent in five languages and is a registered Architect in the United States and the European Union. He currently serves as President of the Luxembourg- American Chamber of Commerce. Olga worked for the government division of Historic Zones and Monuments in Old San Juan, PR. After her year of schooling at the Ecole de Architecture in Versailles France, Olga worked at Adrian Smith + Gordon Gill Architecture where she was a critical part of several teams designing buildings all over the world, including Dubai, China, and Mumbai. As an experienced business development professional and former entrepreneur, Roger possesses the motivation and dedication which is necessary to build and maintain long-term client relationships, and is committed to serving the needs of existing and future Spacesmith clients. Roger has a historical interest in architecture and design, and a love for all things nautical, especially sailing and the rich maritime history of New York. Will Wong is a life-long New Yorker who is intrigued by the constant evolution of the city’s skyline and infrastructure. Having grown up surrounded by new construction, he is interested in the critical and complex process of building in a dense urban environment. His awareness of designing projects is relatable to the human scale. Will is a registered architect in the State of New York and enjoys traveling with his wife and son in his spare time. Will is a leader in project management across the firm’s workplace, retail, academic, and profit projects. He is known for his critical approach to complex planning, design, and construction processes. Since joining Spacesmith in 2012, Will has led work for such diverse clients as Li & Fung, Major League Soccer, Columbia University, and Abrams Books. He holds a Bachelor of Architecture from Rensselaer Polytechnic Institute.